Pimpin' Aint Yeasty : Waste Not vs Want Not: Do Beer Drinkers Care? Waste Not vs Want Not: Do Beer Drinkers Care? 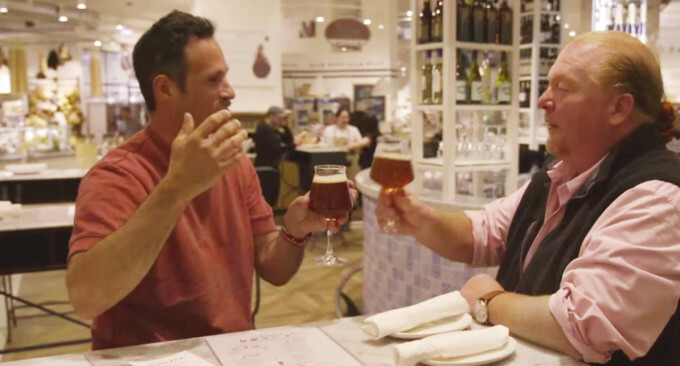 Recently I had the pleasure of attending an event thrown by Sam Calagione (DogFish Head Founder/President) & Mario Batali (Star of Iron Chef and several other of his own cooking shows), at Birreria their microbrewery/bar, above Batali's popular Eataly, in New York City. They were celebrating the premier of the latest episode of their new Web-series: That's Odd, Let's Drink it! This episode was about food waste. Apparently Americans throw out/waste, up to as much as 40% of our food. Batali' and Calagione decided to address this issue and develop a new beer called Waste Not Pruno. The word pruno comes from an Italian term for a wine made by prison inmates using whatever ingredients they are able to get their hands on. We're talking about scraps of bread, canned fruit cocktails, even ketchup. For the beer version of Pruno, the idea was use quality ingredients that are on their last legs, close to expiration, and would normally have been thrown out. Ingredients of Pruno include overripe tomatoes, grapefruit, oranges, and ugly fruit. Its a wheat-based brew, served from a cask, that sneaks in a 7.1% ABV that feels much lighter, despite packing in some serious flavor. Pruno was the center of attention, behind a bar that included an excellent array of beers. An almost total Dogfish Head takeover, was accompanied by a few taps of NYC's newest all-star brewery, Other Half. Other Half is currently the most sought after beer maker in the area, with lines wrapping around their building whenever they offer a new can release. I got to meet their two brewer/owners. It was pretty amusing to me that not only were they wearing their own brand tee-shirts, but they were also drinking their own beer at an event focused on Dogfish Head and the Pruno. They seemed like awesome guys. WastED, NYC based pop-up restaurants, were created around the theme of decreasing food waste. Menu items have included items like fish heads and collars, broken razor clams with pig's ear vinaigrette, monk fish tripe, bruised fruits, and semi-wilted vegetables. The name WastED is also used for an associated community of chefs, farmers, fishermen, distributors, processors, producers, designers and retailers. These groups are all working together to re-conceive “waste” that occurs at every link in the food chain. "Our goal is to celebrate what chefs do every day on their menus (and peasant cooking has done for thousands of years): creating something delicious out of the ignored, or un-coveted, and inspiring new applications for the overlooked byproducts of our food system." So, apparently some beer drinkers do care about not wasting food, and are making efforts towards change. I'm doubtful this mentality is the norm. How about you? Does food waste matter to you? Would you go out of your way to buy beers that were proactively working to help reduce the problem, if they also tasted great? I've seen a couple of other events at other places, but this was my first time in here. It was amazing! Great venue, it's smaller than those bigger places but it is still a fair sized venue. Food at venues in NYC was great and I think it's recently renovated - it didn't seem old or anything.